If you are afraid of bears when you go camping then this is t-shirt you should not have a look at as it has a funny bear on it. 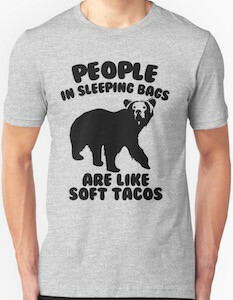 As you can see the t-shirt shows a bear and the text “People in sleeping bags are like soft tacos”. And yes that is funny but please don’t forget bears don’t really eat people so just be your taco self while dreaming away in your little tent on the campground. You can get this funny bear t-shirt in men and women’s styles in sizes ranging Small – 3XL and it is available in many fun colors to. Do you think Taco’s and Nacho’s are friends? If you look at this t-shirt then you may think they are not. This t-shirt comes in men, women’s and kids sizes and different styles and colors to. And on the shirt it shows a Taco and a Nacho with cheese and they are not having a great time. The Taco says to the Nacho “Let’s just Taco ’bout it” and the Nacho answers “No I’m Nacho friend”. It sure is a funny t-shirt if you like this kind of food or just funny shirts. 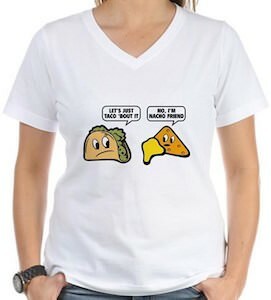 So lets see if we can make them friends again by wearing this Let’s Just Taco About It T-Shirt. The picture on this t-shirt is pretty easy to understand. It shows a taco with a fish in it and yes it has all the toping to of course. 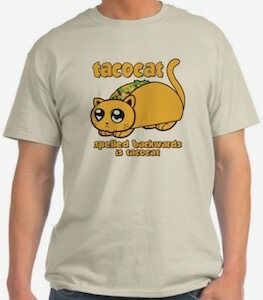 You can get this fish taco shirt in 3 colors natural, light blue and ash grey (the one on the picture). I don’t know much about fish taco’s but one thing I do know and that is they they don’t look like the picture as there it seems like a fish fresh from the water is put in the taco with it’s head and tail sticking out. Of course the picture looks great and just talking about it makes me hungry. 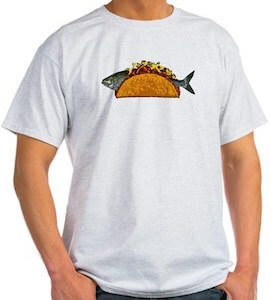 If you like fish and taco’s then you just have to get this Fish Taco T-Shirt.